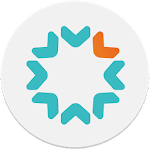 Tala is the #1 solution to build your financial future! Get loans at your fingertips--whenever, wherever. - Verify your identity by uploading ID through our secure system--no paperwork needed! 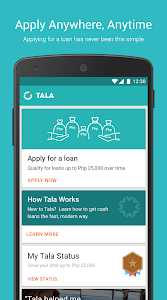 - Grow with Tala and build your limit up to Php 10,000 by making loan payments on time! Join the thousands using Tala to start and grow businesses, pay for schooling and manage expenses with peace of mind. Download and apply today. Salamat! Terms and Conditions: Tala charges a service fee of 11-15%* of principal. Repayment schedules may vary; however, the maximum repayment period for a Tala loan is 21 or 30 days from disbursement. Maximum late fee of 8% of principal. Additional terms and conditions apply. *Effective APR: 183-191%. Tala will never charge you more than the amount of your service fee (plus, if you do not repay on time, a one-time default fee). Interest and fees do not compound or accrue.